Is it raining where you are, internets? It’s raining here in Austin…a beautiful, steady rain. I’d love it even more if I didn’t have to go out in it…but it’s off to work for me in a few minutes. I wanted to share this recipe that we made a few nights ago…it’s one of Justin’s favorites. He always adds a bit of Sriracha sauce at the end, because he likes to burn his face off. Combine first 7 ingredients in a small saucepan. Cook over medium heat 5 minutes or until smooth, stirring frequently. Remove from heat. Meanwhile, heat olive oil in a large skillet over medium-high heat. Add tofu and cook for 4 to 5 minutes, then flip and brown at least one other side of the cubes, about 4 to 5 minutes more. Transfer tofu to a plate and keep warm. Add bell pepper and carrots to pan, and saute 5 minute or until just tender. 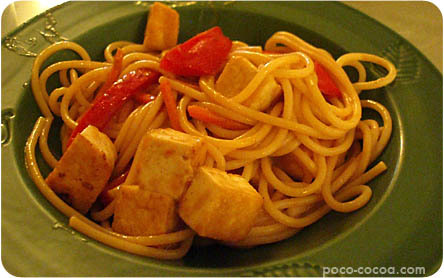 Toss pasta, tofu, vegetables, and sauce together in a large bowl, and serve. Thunderstorms in Spring Branch, Texas. Had to race home from work to let the dogs in. One of my dogs, Bridget, is afraid of thunder. Poor baby girl. Dish looks yummy! oh yeah, that’s what i’m talking ’bout–WITH Sriracha, j’s right! thanks for sharing this tasty recipe, pc.